A lot of doctors now recommend surgery to their patients but is surgery really the only option?? It is indeed overwhelming to see the kind of development India has seen in the field of medicine. From bringing in the latest technology for diagnosis and surgeries to having internationally qualified doctors, India has become a medical hub and people from across the globe come here for treatment. Despite all this development, people are still misguided into unecessary tests and surgeries. According to a study done by the Times of India a resident of Kandivili, Gautam Sharma had severe left shoulder pain and was advised cardiac surgery the very next day itself. But he has a feeling it had nothing to do with the heart but to do with the shoulder bone itself. He took a second opinion and sent his ECG to a doctor in the US who in turn connected him to an orthopaedic surgeon there. The orthopaedic surgeon said his bones were not aligned properly and that was causing the pain. He was taught some exercise and today his pain is much better and he is leading a normal life. 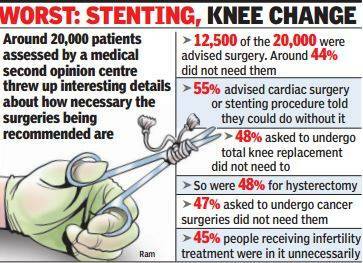 According a study done by an organisation specializing in second opinions in Mumbai on 12,500 patients almost 44% of the patients were advised against surgery when they went in for a second opinion. This is the situation in India, but that does not mean that doctors in USA do not recommend surgery. According to a study done by USA Today (www.usatoday.com), Jonathan Stelly a pro baseball player fainted once while playing and was rushed to a cardiologist. The cardiologist said he needed a pacemaker if he wanted to live even till 30. He underwent the surgery and had a pacemaker implanted but months later he heard that the cardiologist had been arrested for unnecessary surgeries. He also learnt that all he needed was blood pressure medication! The doctor had not just put him through an unnecessary surgery but also taken away the love of his life baseball. According to US Today in the US unnecessary surgeries account for 10 t0 20% of the surgeries done every year in some fields including cardiac, knee, spine surgeries and hysterectomies. ARE WE OVERDOING KNEE SURGERIES? An overdose of surgeries has been commonly seen in the field of orthopaedics especially in terms of knee replacement surgeries. The Indian Society of Hip and Knee Surgeons reports that 66,352 total knee replacements were done in the country in 2013, compared to merely 9,951 cases reported by it in year 2008. Dr C S Yadav, professor, department of orthopaedics at AIIMS says that nearly 30 to 35% of knee replacement surgeries done in India are unnecessary and so patients at AIIMS are being educated about lifestyle modifications and exercises which can help them avoid surgery. Another surgery which has become increasingly common in India is a hysterectomy or surgical removal of the uterus. This is usually recommended in women of menopausal age who have excessive bleeding, fibroids, cysts etc. 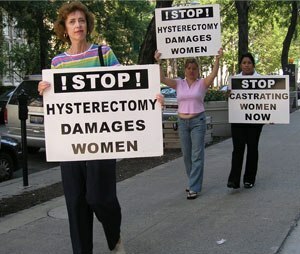 Many women across the country have undergone unnecessary hysterectomies and later regret it. According to a survey done by Oxfam in a village in Rajasthan, out of 285 women investigated to, 258 had undergone hysterectomies in 6 months and the youngest amongst these was just 18 years old. These surgeries simply exploit the rural women who really don’t need surgeries and are threatened into having these surgeries putting fear of cancer into them. Surgery is also preventive if you have developed any tissues or extra growths. To determine the stage in which your cancer is and to decide the line of treatment. To relieve stress and pain especially if you have a tumour pressing on a nerve. Surgeries are becoming so common these days that it has become important to understand the reason behind this attitude of doctors and why they are prescribing so many unnecessary surgeries. Lavish and unnecessary use of medical technology to do tests and surgeries. Failure to counsel patients on whether the surgery is necessary or not. Aggressive marketing my companies and hospitals regarding surgical procedures. Incentives provided by companies to doctors for performing surgeries. A complete check up by the phyisican or family doctor to decide whether the surgery is required or not. Discussed with the doctor about alternate lines of treatment which can help avoid surgery. Taken a second opinion that also indicates the need for a surgery. Surgeries are traumatising regardless of what surgery one is undergoing and how good the doctor is. 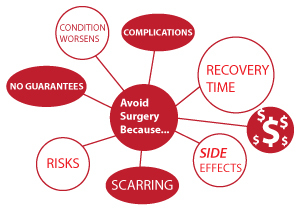 How can one avoid a surgery? Hysterectomy– Menstrual problems like heavy bleeding can we dealt with medicines easily. Simpler procedures like monomyectomy for fibroids, knife free procedures for endometriosis and other lesser invasive procedures are today available for uterine problems and can help avoid surgery. Cardiac procedures– Angioplasties and bypass surgeries have become so common these days. Even for a heart burn doctors tend to misguide the patients that they have a heart problem and first do an angiogram and then say there are blocks and surgery is needed. Instead modifying life style, eating healthy and taking the right medications can help restore cardiac health. Orthopaedic procedures- replacement surgeries are commonly prescribed these days for knee, hip, spine and shoulder problems. Meeting a good physiotherapist and learning the right exercise, losing weight, wearing proper foot wear can all help in avoiding these surgeries. So, your doctor has just broken the news to you that you have a major problem and require surgery and now you are going through that trauma. Well! Rather than being distressed get up and look around yourself. 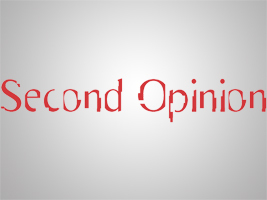 Second opinion is always there to help you and guide you on your course of treatment. GrandOpinion (www.grandopinion.com) is a portal which can help you during this time. Just get onto the portal and share your details and reports, let the team of doctors study your case and revert to you. In most cases SecondOpinion has helped to prevent surgeries. A shoulder pain need not be a heart problem, a knee pain does not necessarily call for a replacement and an excessive bleed does not mean hysterectomy. It could just be a red signal for you to stop, slowdown in life and care for yourself. You might just need to modify your life style, diet and exercise or just undergo a minimal non-invasive procedure and you can avoid going under the knife! GrandOpinion (www.grandopionion.com) can just guide you of a surgery, because surgery is definitely not the only option!